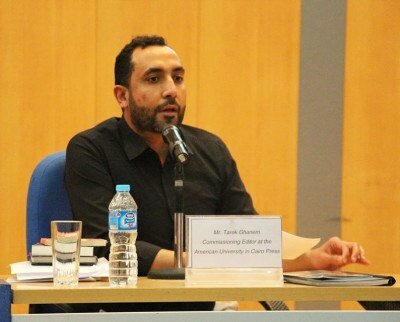 Tarek Ghanem, who recently joined the AUC Press team as commissioning editor, participated in last month’s ‘English Language Day Programme‘ entitled “World Englishes: One Language, Different Cultures” at the French University in Egypt. Ghanem spoke about “The craft of translation: Cultural aspects and readers’ experience.” Here are extracts of his presentation. “In essence, translation is not an act of cultural diplomacy or explaining. It is about learning what is foreign, unfamiliar, culturally and linguistically particular or strange, and, to a lesser degree, asserting the universal. In literary translation, the job of a good translator is closer to a restoration expert than that of a curator; although some minimal and strategic curatorial work might be needed here and there. Without standing in between the original author and the the new reader in a new language, a translator should keep the reader experience as enjoyable, fluid, and transparent as possible.This might mean asking oneself many question before starting the actual translational work: what kind of text is this? What kind of writing style is this? Can such linguistic indulgences and jokes, for example translate well? How can I echo the voice in the original language as accurately as possible and not whitewash or flatten its originality and uniqueness?